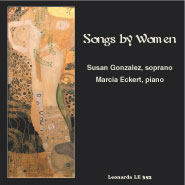 Five Songs for soprano and piano (1986) has been recorded by Susan Gonzalez and Marcia Eckert on the album Songs by Women. This album also includes music by Joyce Hope Suskind, Ruth Schonthal and Elizabeth R. Austin. ‘Five Songs’ for soprano and piano is published by Southern Music Company (Art Songs by American Women Composers Series edited by Ruth Friedberg – FIVE SONGS, Vol. 12, Fabregas (V107).